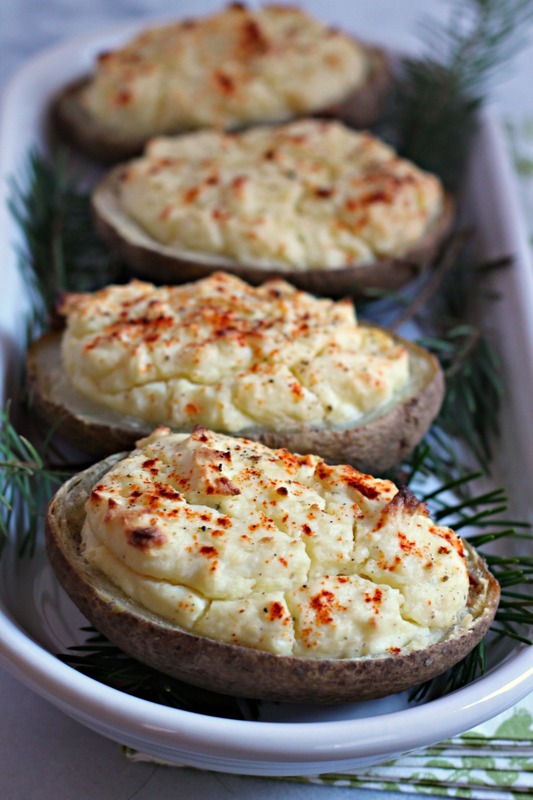 These Twice-Baked Boursin Cheese Potatoes are a cheese-filled side dish that perfect for holiday parties and dinners. Plus, you can make them ahead of time – a great time saver! For us, the holiday season is all about the side dishes. Salads, soups & chowders, dinner rolls, vegetable gratins, grains, potatoes. My husband and I are big potato lovers, whether it’s creme fraiche mashed potatoes, sweet potato gratins, or these gorgeous twice baked potatoes. Since both of us are sous chefs, we experiment with a variety of ways to serve potatoes to our guests during dinner service and these are my favorite. Twice baked potatoes are the best option when you’re looking for a side dish you can make ahead of time. All you need is to fill these potatoes and just throw them in the oven before serving. They keep in the fridge for a maximum of four days (there’s an egg in the filling that wouldn’t want to be kept longer), so it’s a fantastic dish to make that alleviates your kitchen duties the day of. This recipe uses three cheeses: parmesan cheese, cream cheese, and the one that gives it the great flavor, Boursin cheese. The people over at Boursin haven’t heard of me, but I definitely recommend using this garlic & herb cheese spread to add big flavor to these potatoes! You can find it at your local store next to the dips and hummus, and I bet you’ll fall in love with it! We’re big fans and add it to dishes on a weekly basis. These Twice-Baked Boursin Cheese Potatoes are perfect for holiday dinners - they look lovely whens served and aren't just your typical potatoes. Plus, with three cheeses in the mix - your guests will surely love them! Oh and they freeze beautifully! Preheat oven to 350F. Scrub and wash potatoes and place on a baking sheet. Bake potatoes for 1.5 hours, until cooked all the way through. Let cool. Cut potatoes lengthwise and remove most of the potato pulp from each half, placing through a ricer or mashing them until smooth. Add the Boursin cheese, sour cream, cream cheese, parmesan cheese, and egg. Season with salt and pepper. Place potato halves on baking sheet and pipe or spoon filling into potato skins. Sprinkle with paprika and bake for 30 minutes. Serve immediately.